Celtic really put the cat amongst the pigeons in terms of the title race at the weekend as we hammered Hearts 5-0. Hearts have been the side to watch so far this season but in the last two weekends, we have shown them that they’re only going to be that for a tiny bit longer now. We knocked them out of the cup and now we’ve hammered them in the league, leaving top spot now very much in our reach. Away from the pitch, though, we’ve also released our insider DVD into the making of the double treble and at the launch Brendan Rodgers and Scott Brown were in attendance to field questions. Gerry: ???? "Does Scott Brown typify to you the way a Celtic Captain should lead, should live, should act!" Certainly, it’s clear Brendan is one of the best managers we’ve had at the club and, similarly, Broony is one of the best players. 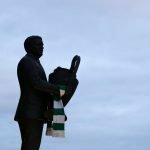 Someday they will build a statue of Scott Brown on the Celtic way, along with the greatest. yes he has been fantastic. He just gets on with it. In my 53 years as a fan, he must be in the top 5. The highlight of my day is rejecting the advertising popup that continually invades this site, Hitting reject all and then click to see all vendors and then hitting reject all really makes my day all the more enjoyable. I’m sure others are delighted with this pop-up. Perhaps the web designer could input some code so that we could do this every 5 seconds, just a suggestion.